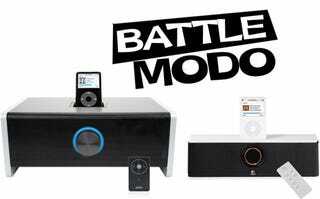 There are only three battles left in our iPod Dock Bracket, and we will have a final verdict by the end of the week. Yes, we're amazed, too! 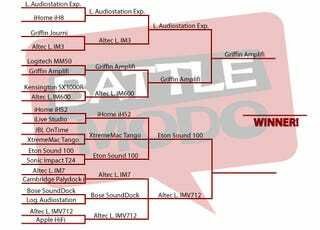 For our first semifinals battle, our kings of cheap battle it out for the Cheapo Dock title. In one corner we have the AudioStation Express. In the other, we have the Griffin Amplifi. In terms of design, the two docks have a similar, simplistic HAL-knob design. The Express is tiny, like a sporty scooter that can hook to your TV through video out. The Amplifi is much bigger, heavier and...dare we say...meaner, but there are no extras other than standard audio input. So while the Amplifi is well-built (the knob clicks like a receiver, wooden construction is a bonus), this round easily goes to the Express since it's smaller and slightly more feature-driven. For the budget audio showdown, I went through multiple genres, and multiple songs within each genre. I still appreciate the low range of this system. It's not necessarily real bass, but it almost fools you into thinking it's there. Take your average bass line. It's strongly present, even if not necessarily completely honest in its represented range. Highs are well-represented with a tendency to blend a bit, missing some of the higher instrument textures. If I could describe the experience in one word, it would be "tasteful." But the Logitech is easily a tier, or even two, below the Griffin. The Express has no mid to low range fullness, making the entire sound field narrower than the Amplifi's. Surprisingly, regular rock performs poorly compared with other genres of music, such as solo acoustic, if only because of the disappointing low response that frequently grows muddy. High frequencies are actually pretty decent, with budget considerations taken into account. Every genre, from rock to classical, goes to the Amplifi. With the Grffin's product, even though I am still compromising on perfect audio, it's just so much more fulfilling to listen to than the Logitech AudioStation Express. Who wins? This is a tough call—probably the toughest of the competition. Sure, the Griffin sounds better. But it's almost three times the size of the inconspicuous Express. And the Amplifi's price runs $50 more than the $80 Express, which is quite a bit on the budget system scale. It took some honest soul-searching, a dramatic walk on the beach and 3/4 of a Michael Bolton album accompanied by 4/4 of a bottle of wine. But I came to a difficult one-man consensus. It's no frills, and it's big. But at $130, you won't find a better sounding dock. For those who are looking to save money and space, we still heartily recommend the AudioStation Express. But the extra $50 is well worth the improved sound.